How conservative is the Russian regime? "A strong president means a strong Russia!". Photo: Andrey Pronin / Zuma Press / PA Images. 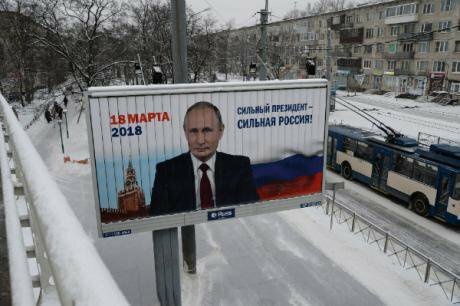 All rights reserved.The atmosphere of Russia’s recent presidential election and Vladimir Putin’s predictable victory seemingly leaves no doubt that the current Russian regime is conservative. The boring election was, in fact, a plebiscite in which affirming one’s fealty to the nation’s leader resembled pledging loyalty to the country itself – to its history, sovereignty and political traditions. The election campaign was a performance, and the roles were carefully blocked out by Kremlin strategists. An embodiment of the “perpetual present”, a present that rules out all unpredictable change, a depoliticised Putin towered over the pitiful opposition candidates, who stood in for the arbitrariness and irresponsibility of political gamesmanship. This image of the present does not envisage circumstances whereby people can choose their future themselves: they can merely affirm their complicity in an unspoken pact amongst the generations. Russian citizens thus made their true choice by observing rituals and performing long-standing practices. Politics, per se was, beside the point. The Putin regime’s conservative, anti-political, and anti-democratic method of self-legitimation, however, is a natural fit with the market rationale that permeates Russian society. The rejection of political choice is justified not only by fealty to traditions, but also complete mistrust in public life – whatever its shape and colour. The flip side of this prevailing conservatism is individual self-concern, the priority of private interest over the common good. The sustainability of the government’s conservative rhetoric, combined with market-driven social atomisation, was especially evident during Putin’s previous term as president (2012–2018). This was a period that witnessed the growth of state-promoted nationalism, especially after 2014, when the annexation of Crimea and confrontation with the west dovetailed with the commercialisation of medicine and education, as well as an overall reduction in the Russian state’s obligations to society. The so-called “Crimean majority” (the silent majority of patriotic Russians who rallied around the Kremlin’s foreign policies) was marked by its pride in the revival of “historic” Russia and its ever-growing distrust of specific government institutions. It has long been a commonplace to view these institutions (specifically, the police, the courts and high schools) as ineffective and corrupt. This distrust, however, has been reflected not in the rise of protest movements, but in the “depoliticisation” of social ills. The assumption was that individuals could not count on the state and must thus be responsible for the safety, health, and economic well-being of their families. Moreover, the hegemony of private interest encourages us to sympathise with each and every corrupt official, who, like everyone else, merely wants to secure a better future for their loved ones. This depoliticisation of social ills has been quite in keeping with neoliberal-minded reforms in Russia’s social sector, where the state merely offers services to the public on mutually beneficial terms. Despite the authorities’ rhetorical embrace of Russia’s “special path”, the current ideological conjuncture can be fruitfully compared with the neoconservative turn in the west, as exemplified by the policies of Thatcher and Reagan 30 years ago. It was then, during an economic crisis, that the right’s attack on the welfare state took the shape of an authoritarian populism featuring previously incompatible ideological components, such as the appeal to conservative values and the defence of the market’s unlimited sway. Thatcher’s famous adage (“There’s no such thing as society”) directly contradicted the foundations of the conservative worldview, in which society had been a defining category. Thatcherism was a break not only with the previous social democratic consensus, but also with conservative political tradition. 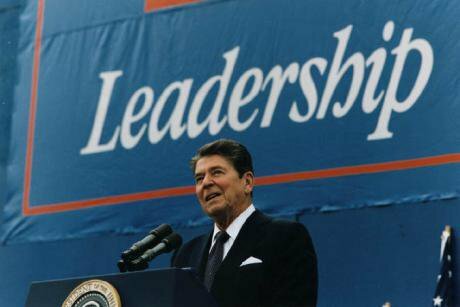 Ronald Reagan on the campaign trail in 1984. Source: Reagan Library / Wikimedia Commons.Since Disraeli’s time, English conservatism had opposed liberalism to the long-standing unity of the nation – a unity vouchsafed by a shared way of life and mutual obligations. Conservatives did not regard government as a night watchman whose only job was to protect private property and ring-fence private life, but as society’s natural extension, its shape. The relationship between state and subject was not a rational contract. It was based on authority, and it drew on the metaphor of the father vis-à-vis the members of his family. At the same time, conservatives were always averse to the social democratic notion of “public interest”, since it involved vigorous state intervention in the economy. Conservatism’s aversion to norms and its sceptical attitude to universalist theories like liberalism and socialism have always lent it exceptional flexibility and adaptability with respect to different countries. Conservatism has always acquired a different content, since it has been defined by the unique ways of living in each particular country, although the political style itself has shared a deeper rationale. Conservatives see freedom as meaning something else – as the very right to difference, as the nation’s capacity to stay true to itself and its history. Freedom thus overlaps with the notion of sovereignty. All attempts to limit it for the sake of abstract principles, such as human rights, are thus a threat to freedom. True freedom belongs to the social body, whereas individuals, on the contrary, are limited in their freedom of self-determination. They are not free to choose the nation, gender, and class to which they belong, since all these things are defined by the society into which they were born. It is not hard to see that the basic building blocks of the current Russian state’s discourse map onto these attitudes exactly. We find the same fight for sovereignty (true freedom) against the normative restrictions imposed by the west, and the hegemony of historic ritual over the letter of the law. Putin thus means more as the nation’s purported leader than the institution of presidential power as described in the 1993 Russian Constitution. The Russian state attacks all attempts at revolutionary change from a consistently conservative stance, drawing historical parallels between the events of 1917 and recent so-called “Orange Revolutions” in the former Soviet republics. The Russian conservative critique also constantly stresses that the doctrinal fanaticism of revolutionaries, who experiment with societies grounded in history, has usually been cynically exploited by foreign adversaries to undermine their national sovereignty. Preserving true freedom from the seductions of false freedom is guaranteed not only by combatting the revolutionary threat, but also constantly taking measures to reinforce moral discipline: abortion rights are restricted, homosexuality is criminalised and so on. The rhetoric of defending family values, which goes hand in glove with these disciplinary measures, is a direct reference to the conservative metaphor of the state as a large family whose members are bound together by mutual obligations. In this sense, moralistic discourse is a universal feature of neoconservative politics, whether in the US during the administration President George W. Bush or Russia under Putin. In the face of deepening social divides, it generates the illusion of unity, moral majority closing ranks against foreign threats and the selfishness of minorities demanding defence of their civil rights. 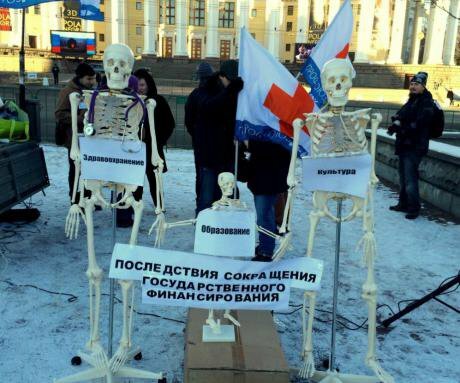 ”The consequences of government cuts to culture, education and health” reads this display at a protest organised by Deystvie, Russia’s doctors‘ union, November 2015. Photo courtesy of medrabotnik.orgThe neoliberal policies consistently pursued in Russia since the early 2000s have been peddled as purely rational, as unencumbered by ideology and politics. The reduction of the state’s obligations to society, tax breaks for big business, liberal reforms of labour laws and commercialisation of the public sector have been implemented by technocratic governments whose arguments invoke common sense and the know-how of other countries alone. The president, who symbolises society’s unity and historical continuity, has usually avoided publicly defending neoliberal policies, leaving the job to his depoliticised bureaucracy. The division of portfolios between the president and the government dovetails with the hegemonic conservative-liberal symbiosis overall. What matters is that the symbiosis is devoid of apparent inconsistencies, embedding neoliberal rationality and the conservative political style within an ideological unity. Wendy Brown has compared the American take on this unity with the dream work, as described by Freud, where thoughts and emotions incompatible with reality are happily displaced by the imagination’s unconscious protocols. In this reading, neo-conservatism is not a mere rhetorical screen for neoliberal policies, but generates the overall ideological structure. It is crucial the structure’s own inconsistencies are not resolved. Rather, they are preserved in a state of reconciliation, whose features are dictated by specific historical circumstances. Is Russian conservatism opportunistic or axiomatic? A popular leitmotif of Russia’s current period of stability is what might be called the birth of order from chaos. Per this narrative, the retreat from long-standing Russian historical patterns and the embrace of universalist liberal doctrines during the Gorbachev and Yeltsin administrations generated social catastrophe, moral degradation and a real danger of Russia’s losing its sovereignty. The oligarchs took advantage of this erosion of state authority, turning the country into an arena of unfettered competition for power and resources. Putin’s advent reversed these threatening trends by firmly separating business and government, thus returning the country to its dignity. The Putinist renaissance, however, not only involved revisiting the reforms of the 1990s, but, on the contrary, melding their outcomes with the continuity of Russian traditions of governance. It borrowed all the best aspects of the imperial, Soviet and Yeltsin periods, as it were: a heavyweight foreign policy, Christian morality and strong property rights. This genealogy facilitated the political expropriation of both opposing camps during the Yeltsin period: pro-western liberals and the so-called patriotic opposition, including the Stalinists from the Communist Party of the Russian Federation (KPRF) and imperial nationalists. On the one hand, the new official conservatism satisfied demands for a foreign policy independent of the west and rehabilitated the Soviet past as a legitimate part of national history; on the other, it strengthened the market institutions established in the 1990s. In the terms of the latter, it acted like a Bonapartist, preserving the revolution’s social gains while reassessing their political value. Since the 2000s, a considerable number of elite Russian liberals have abandoned their previous political selves, serving as consultants on implementing neoliberal reforms or integrating directly into the state bureaucracy. This strategy was the basis of a liberal conservatism that regarded the rejection of liberal democratic principles as a necessary sacrifice that would make Russia’s transformation into a market economy irreversible. Conservatism’s anti-revolutionary aspect played a central role in this case, whereas the rhetoric of historical greatness and morality was regarded as instrumental and derivative. Meanwhile, former members of the patriotic opposition cherished the hope that sooner or later Putin would release himself from his obligations to the Yeltsin-era liberal elites and would set about implementing a thoroughly nationalistic conservative programme. If, following Samuel Huntington’s well-known classification, we can term Russian liberal conservatism “situational”, then the second case would have to be termed a conservatism of values. The relative proportions of official conservatism’s two ingredients have always been in flux throughout the Putin regime. Whereas situational conservatism dominated during the economic boom and the unsuccessful attempts at integrating Russia into the western hegemonic system in the noughties, the outset of Putin’s third term as president in 2012 and the nascent confrontation with the west after the annexation of Crimea in 2014 should obviously be defined as a turn toward the rhetoric of axiological conservatism. However, what members of both ideological camps regarded as tactical fluctuations were, in fact, parts of a uniform ideology. 14 December 2011: free elections protest in Moscow. CC misha maslennikov / Flickr. Some rights reserved. By 2012, the Putin regime had arrived at a political crisis, spurred by popular protests against vote rigging during the December 2011 parliamentary elections. The regime responded to the crisis by engaging in an abrupt rhetorical transition to a conservatism of values. 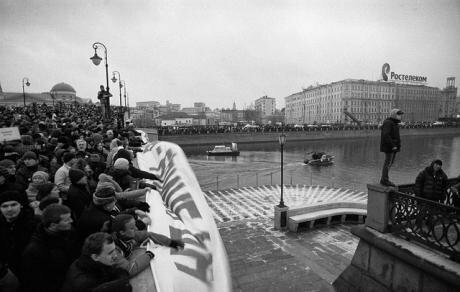 The democratic protests were spun as a revolt, directed by outside forces and driven by hedonistic members of the Russian upper middle class, against the Russian “cultural code”, as embodied by the patriotic majority and the nation’s political leader. The annexation of Crimea was the climax of the rhetorical conservatism of values. Unconditional support of the regime’s foreign policy was categorically equated with affirming one’s loyalty to the country and its historical choice. The fronts in the cultural wars between the so-called silent majority and the selfish minority virtually turned into a point of confrontation between Russia and the west. This stance was quite clearly articulated in Putin’s famous speech of 18 March 2014, in which critics of the annexation were branded “national traitors”. The turn to political conservatism coincided with the onset of economic stagnation, attributable to the limits of growth under post-Soviet capitalism’s model of society. The government responded to the structural economic crisis, exacerbated by a decline in oil prices and western sanctions, by slashing social spending. The government’s anti-crisis economic policy largely aped the austerity measures enacted in the European Union and were even tougher. The conservative discourse, which had virtually criminalised all grassroots protests as unpatriotic and playing into the hands of foreign foes, legitimised the Russian variation of austerity. The phase of the Putin regime’s evolution that kicked off in 2012–2014 has thus been marked by simultaneous radicalisation of both halves, neoliberal and conservative, of the ideological symbiosis. At the same time, their discordant unity has acquired an ever more coherent shape in which the idiom of axiological conservatism has served as the natural expression of neoliberal content. Thus, Russia’s unconditional sovereignty and the moral and political unity it imposes on society has been proffered as a necessary condition in the global fight for resources, a fight depicted as a natural extension of the law of competition amongst individuals, while conservatism’s scepticism towards doctrines that limit sovereignty in favour of universal rights has led to the suspicion that all appeals to defend society’s interests are hypocritical. Paradoxically, the rationale of competition has infused the conservative notion that the communal has priority over the personal. A typical specimen of conservative discursive performativity was Putin’s recent statement that the aspect of collectivism was still a strong presence in the heart and soul of the Russian people, and the ability to work as a team was nowadays a competitive advantage. The radicalisation I have described, involving both neoliberal policies and the conservative rhetoric that has attended them, definitely testifies to the regime’s protracted crisis. Its further progress will inevitably lead to ruptures in the current ideological hegemony. These breaches by reality of the dream’s illusory unity, to once again evoke Wendy Brown’s metaphor, will be occasioned by the need for ever more radical neoliberal reforms, reforms increasingly inimical to society. This text was originally commissioned for the Slovak magazine "Kapital", 8/2018. Translated by Thomas H. Campbell.